Recorded in a wide range of recordings including Hildrip, Hilldrip, Hildrip, Hildrop, Hilldrop, Hildrup, Hilldrup, Hilldrut and others, this is an English surname. There are two possible origins. The first being that it is locational from a now 'lost' medieval village possibly called 'Hyllrop' meaning the top of the hill. 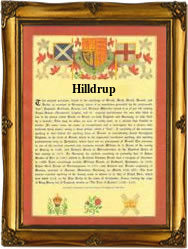 The second possible origin is that it is a transposition of the popular early medieval name personal name Hildred. First recorded in the 9th century as Hildreth meaning 'Battle-counsel' this early name has given rise to a large number of surname spellings very close to the known spellings of this suname. Given that spelling over the centuries was a luxury enjoyed by fewer than 10% of the population, and that local accents were very thick, almost anything is possible with a surname. 'Lost' villages are a feature of the the British maps and gazetters. It is estimated at at least three thousand, and some researchers say many more, have literally vanished since Elizabethan times, usually leaving as their only public reminder, the surviving surname in a myriad of spellings. Early examples of the surname recordings include Basill Hilldrop, who was christened at St Mary Whitechapel, Stepney, on January 21st 1628, and Elizabeth Hilldrup who married Anthony Fooks at St James, Dukes Place, Westminster, on October 22nd 1695.